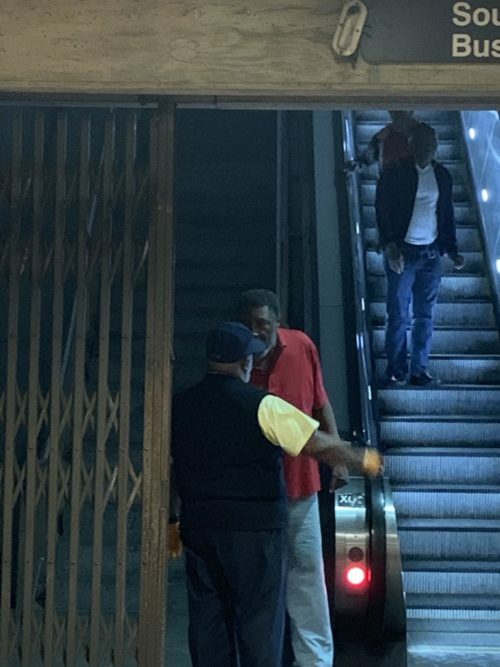 Wanted to alert you and others about an individual (see red shirt) that accosted my girlfriend and I as we tried to enter the Columbia Heights metro station after an otherwise nice night out. Official reports filed with WMATA too, of course. It was near closing so the gates were partially up and thus limited egress into station. Individual in question blocked our way at the bottom of the escalator and menacingly stared us down while mumbling and grunting. Thankfully, after a very scary, tense moment, some nearby construction workers got his attention enough for us to slip by. As we got into the station, the manager on site (also pictured) confronted him – assertively but professionally. Wasn’t able to get any names of the workers or manager in our ensuing rush to try and make the trains we needed (spoiler: we didn’t), but want to thank them for their help/reactions. It sounded like the manager has had to deal with this individual before (perhaps earlier today/tonight even).